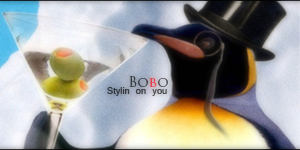 My name is Bobo, or Chugs in irc if you've seen me. I'll be trying to fill a role of a scripter over time. I'm incompetent right now but give the Bobo some time. Jam on the waffles!?! I think im in love. Welcome! Glad to have a scripter-to-be joining us. ^w^ Maybe if you get profficient, you can mod the boards here. If you want, of course. Welcome to the forums Bobo! Thanks all! I will dazzle you with my skills someday.